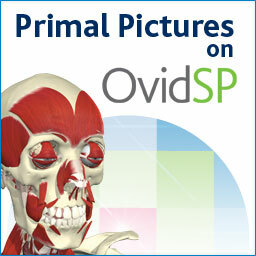 Primal Pictures Anatomy & Physiology Online (OVID) acts as a comprehensive learning resource for students of anatomy and physiology. The human body is divided into 19 modules, with interactive 3-D images, informative text, learning objectives, topic and module quizzes, clinical information on related diseases, case studies and more. Students can interact with anatomy by peeling away layers, rotating models, and reconstructing layers back to their original structure. Vodcasts, narrated animations and illustrations, pronunciation guides, dissection slides, and other multimedia offer an engaging approach to learning. There are also more than 250 clinical topics and case studies covering pathphysiology, and comprehensive clinical information on causes (etiology), symptoms, diagnosis and treatment options. Primal Pictures Interactive Anatomy - Premier Library Package (OVID) is a comprehensive selection of dynamic, interactive modules featuring more than 6,500 highly accurate, three-dimensional anatomy models. Modules focus on individual organs, regions of the body, or anatomical systems. Using 3-D Real Time, users can rotate models, and add detailed layers of anatomy. The product is also known as Anatomy TV. These products have been purchased by our e-HLbc consortia, with a shared license for 75 simultaneous users. Please note that they require Flash.